Some child seat manufacturers make safety seats that are labeled as LATCH or LATCH-compatible child seats. LATCH stands for "Lower Anchors and Tethers for Children". These seats include two rigid or webbing mounted attachments that connect to two LATCH anchors at specific seating positions in your vehicle. This type of child seat eliminates the need to use seat belts to attach the child seat in the rear seats. LATCH anchors have been provided in your vehicle. The LATCH anchors are located in the left and right outboard rear seating positions. Their locations are shown in the illustration. There is no LATCH anchor provided for the center rear seating position. o Never install a child restraint using the LATCH lower anchors at the center position of the rear seat. 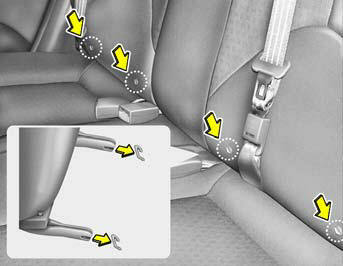 In a crash, the LATCH lower anchors may break if a car seat is improperly placed in the center position resulting in serious or fatal injuries. Only place a LATCH or LATCH-compatible child seat in the left or right outboard rear seating positions (as shown) to the appropriate LATCH anchors provided. o When using the vehicle’s “LATCH” system to install a child restraint system in the rear seat, all unused vehicle rear seat belt metal latch plates or tabs must be latched securely in their seat belt buckles and the seat belt webbing must be retracted behind the child restraint to prevent the child from reaching and taking hold of unretracted seat belts. Unlatched metal latch plates or tabs may allow the child to reach the unretracted seat belts which may result in strangulation and a serious injury or death to the child in the child restraint. Child restraint symbols are located on the left and right rear seatbacks to indicate the position of the lower anchors for child restraints. Follow the child seat manufacturer's instructions to properly install child restraint seats with LATCH or LATCH-compatible attachments. Once you have installed the LATCH child restraint seat, assure that the seat is properly attached to the LATCH and tether anchors. Also, test the safety seat before you place the child in it. Tilt the seat from side to side. Also try to tug the seat forward. Check to see if the anchors hold the seat in place. Do not allow the rear seat belt webbing to get scratched or pinched by the child seat latch and LATCH anchor during the installation.